Climate scientist: air pollution cleanup may be major driver of global warming | Watts Up With That? This is important, climatologically, because a clear stratosphere “lets the sunshine in” to warm the Earth below. To illustrate the effect that volcanic aerosols have on eclipses, Keen prepared a side-by-side comparison (above) of a lunar eclipse observed in 1992 after the Philippine volcano Pinatubo spewed millions of tons of gas and ash into the atmosphere vs. the latest “all-clear” eclipse in January 2018. Total lunar eclipses happen somewhere on Earth typically once or twice a year. Keen is looking forward to the next one on July 27, 2018, which will be the longest lunar eclipse of the century. The Moon will pass almost directly through the middle of Earth’s shadow, remaining inside for 1 hour and 43 minutes. That’s just a few minutes shy of the theoretical maximum. “This will give us plenty of time to measure the color and brightness of Earth’s shadow and, thus, the aerosol content of the stratosphere,” says Keen. For more information about lunar eclipses and climate change, check out Keen’s poster from the GMAC. May 25, 2018 in Aerosols. It seems the idea of explaining that CO2 causes all temperature changes has been eclipsed. I don’t mean to cast a shade on your assertion but CO2 induced global warming has been accepted in totality (well….. 97% anyway). 97% of the theory has been accepted? 97% of the people accept it? 97% of all scientists accept it? 97% of all donkeys accept it? Oh which oh which could it be? Maybe it is 97% of all window lickers accept it. It’s just so maddening. I am at a loss. The vagueness and lack of details make me feel all tingly. I have been pointing out for the last 4 or 5 years the effects of El Chichon and Mt P were to cause long term warming. It is not just the change between max volcanic pollution in 1992 and present but the change from BEFORE those irruptions and five years later. Can we say that 97% of scientists accept 3% of the claims? I work with a lot of ‘scientists’ few of whom accept much of what is claimed at all. Once they delve into the climate claims and math and lack of certainty of the inputs, they revert to type: they flee from assurances and stand aside as mobs run hither and yon. They are too professional to get involved in foolish arguments. Climate physics is a lot less certain than particle physics and particle physics has all sorts of maybe’s and if’s we-assume’s. The major difference is that particle physics has a body of replicable experiments and climate science bas a body of replicable beliefs. Scientists saying, “Trust me, I am a scientist,” has cache, while “Trust me I am a climate scientist,” does not. Pressed for mechanisms and details, the latter equivocates, endlessly. It is like trying to staple Jello to drywall. Q. Why must we invent particles to explain the failure of the models to replicate past temperatures? Q. Why is Miskolczi wrong about the unchanging optical thickness of the atmosphere? Q. Why did sea level rise accelerate until 1930 and then rise constantly when CO2 emissions increased rapidly? I have tried to mount these answers on my Wall Of Evidence. Jello just leaves a stain that doesn’t wash off. I provide an obvious (I thought) spoofing humorous response to Crispin’s humorous entree…. and y’all flip out. I guess I’ll have to use the /Sarchasm tag, even when replying to anothers untagged sarcastic comments. …. and y’all flip out. I think we were all trying to be funny too! Oh look, jmac is using its Disqus name on here as well. Surprise, surprise. You can restate the obvious as many times as you like. The ‘97% consensus’ is a well documented farce, acknowledged long ago by anyone with a small understanding of basic statistics and survey methods. “eclipsed” & “shaded”? You guys are on a roll today. But it would be “moon-shade” not real shade. Sounds like y’all need some 97% Caffeine-free…. hey is 1962 when “97%” became part of the sales/marketing lexicon? Do the warmistas know that that is one of the biggest reasons most people chuckle at them for claiming 97% certainty about everything? 97% of those previously tested as believing it still believe it given the incentive they have to forgo a lucrative career if they fail to continue to do so. it is a big enough part of the qualification to preclude those who do not from getting that qualification and so represents the ultimate in appallingly bad survey structure. No, no, the idea is that cleaning up REAL air pollution adds to the forcing of CO2 as the new ” air pollution”. Now, if we clean up the CO2 “pollution”, then this will cause something else to amplify warming. It never ends, you see. It just bounces around from one thing to another, because being afraid is such a positive psychological approach to modern living. Our level of civilized comfort has removed traditional daily threats from the picture, and so we have to create these other monsters, in order to fulfill our biological need to live on the edge. Without some sort of fear, a lot of people must get bored and feel dead. I wonder whether the incidence of drug addiction would skyrocket, if the global warming scare ever went away. Catastrophic Anthropocentric Climate Alarmists are lunatics. I wrote a similar conclusion in 2016 – see my post below. From my graph, it is clear that the peak cooling effect of volcanic aerosols from El Chichon and Pinatubo was 0.4C to 0.5C, not 0.1C to 0.2C as Keen stated, and each took volcanic aerosol event about 5 years to fully dissipate. There is NO need to attribute any of the observed warming to increasing atmospheric CO2. I plotted the same formula back to 1982, which is where I (I think arbitrarily) started my first analysis. Satellite temperature data began in 1979. It is apparent that UAHLT Calc. is substantially higher than UAH Actual for two periods, each of ~5 years, BUT that difference could be largely or entirely due to the two major volcanoes, El Chichon in 1982 and Mt. Pinatubo in 1991. This leads to a startling new hypothesis: First, look at the blue line (a function of Nino3.4 SST), which shows NO significant global warming over the entire period from 1982 to 2016. Perhaps the “global warming” observed in the atmosphere after the 1997-98 El Nino was not global warming at all; maybe it was just the natural recovery in global atmospheric temperatures after two of the largest volcanoes in recent history. I later added the Sato Global Mean Optical Depth Index to compensate for volcanic cooling. The blue line in the plot (UAH LT global atmospheric temperature calculated without Sato) is a direct function of NINO34 Sea Surface Temperature (SST). The yellow line (UAH LT global atmospheric temperature calculated with Sato) is a direct function of NINO34 SST and the Sato volcanic air opacity index. The red Line is the actual UAH LT global atmospheric temperature. I wrote a similar conclusion in 2016 – see my post below. From my graph, it is clear that the peak cooling effect of volcanic aerosols from El Chichon and Pinatubo was 0.4C to 0.5C, not 0.1C to 0.2C as Keen stated, and each volcanic aerosol event took about 5 years to fully dissipate. Industrial pollution does not have much impact on global temperature. Major (century-scale) volcanoes like El Chichon and Pinatubo definitely do cool the planet – by up to about 0.5C, fully dissipating after about 5 years.. The 1982 eruption of El Chichon was VEI5. The 1991+ eruption of Mt Pinatubo was VEI6, roughly an order of magnitude higher. 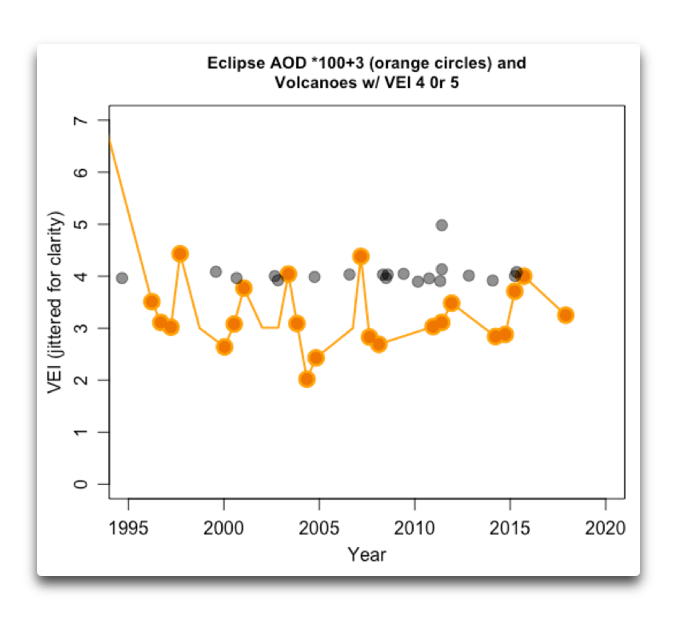 The scale goes up to VEI8, which is open-ended – a VEI8 volcano is going to do more than cool the planet – it’s pretty much going to ruin your day. As the infulence of volcanic aerosols emerges from the shadows. Keen discusses volcanic activity but I wonder just how much change has take place since WWII from the decline in anthropogenic particulates and pollutants. Few people appreciate how much money and effort have gone into reducing and removing anthropogenic particulates from the air beginning in the late 1950s. I wonder just how much more solar energy reaches the surface in the United Kingdom after their ban on soft coal for domestic use, where there had been no control over particulates. When one considers China, India and the third world, I wonder just how much our atmosphere has been cleaned up. Trust them. Aerosols were the favored explanation for any logical holes in the global warming models, until the simpler method of just adjusting the temperatures to fit the model was used. I think you are generally correct Tom, thank you. Here is some supporting correspondence with Douglas Hoyt from 2006 and later. Look up Hoyt – he is highly credible. There is more of my correspondence with Hoyt posted on wattsup. We’ve known the warmists’ climate models were false alarmist nonsense for a long time. This discussion should not take place without some numbers involved. How important are volcanoes, generally and specifically? The Asian brown cloud (from India) is enormous, putting the bad combustion products of over 600m tons of biomass into the air each season. In China the difference is little: over 500m tons without all that coal smoke. Forest and peat burning in Indonesia clearing the virgin jungle to plant oil palms to supply the EU with biodiesel has a large output of particles. Land clearing in Brazil to plant soya, ditto. Annual grass burning in Southern Africa is very widespread over a whole sub-continent. Add to that all Siberian and Canadian forest fires, California if you must. There is a lot of material leaving the ground each year. How does this compare with the total for volcanoes? Yes they are influential, but they are influential against a backdrop of continuous emissions from combustion. If that background changes and there are no volcano eruptions, that is a double-whammy. The next thing to do after quantifying the total mass, is the track where it goes. The smoke plumes from Southern Africa are lofted to Australia, proof for which is available from the SAFARI 2000 project in which more than 200 aerosol scientists tracked a deliberately created large scale fire by satellite, high altitude aircraft and ground observers. Does this material get high enough to affect transmission? At some altitude, yes. Next, is the particulate matter strictly cumulative, short-lived or local and immediate in its effect? What is the clearance rate? The concept of optical thickness soon arises. Surely this can be easily measured on the ground? Remember the global dimming scare in the early 80’s? Soon there wasn’t going to be enough sunlight reaching the ground to grow crops. That was ‘all our fault’ too. Claims for interference and change require context. HI Crispin, hope you are well. Please see my posts above – they may help. An over-simplification, but generally true to date. Industrial pollution does not have much impact on global temperature. Major (century-scale) volcanoes like El Chichon and Pinatubo definitely do cool the planet – by up to about 0.5C, fully dissipating after about 5 years. Has anyone factored out the famous “back radiation effect” for a reduction in air pollution? Or didn’t they bother, since the math in AGW always magically works out, even when the fundamental under “lying”assumptions get changed. Endless , damaging guesses . Endlessly accepted as fact, yet never actually correct. Why some AGWers don’t know what back radiation is … after it’s been explained to them… then they think that the 303 K number is something I …. ” I ” big I, made up. Finally an argument that makes sense. Major volcanic activity has been nil this century thus far. This of course does contribute to warming. I expect this to change moving forward, that is an increase in major volcanic activity. So why hasn’t it warmed this century? Just askin’. And why is it presently cooling? Usually, there’s no presently in the climate, because the climate is at least 30 years long. They had to get the obligatory “greenhouse gas” plug in. What does this mean for the ECS estimate since CO2 seems to have some help? Christy and McNider (2017) included the effects of volcanic aerosols and calculated a maximum TCS of +1.1C/(2xCO2) for the satellite era (since 1979). They ASSUMED (for argument only) that ALL non-aerosol warming was attributed to increasing atmospheric CO2. It is more probable that most of that warming was natural and CO2 played a minor role. If I read Fig. 1 correctly (from S. I. Rasool and S. H. Schnider, SCIENCE 1971), the sensitivity of climate to increasing atmospheric CO2 is estimated to be about 0.5C to 0.6C per [doubling of atm. CO2 from ~300 to ~600ppm], and there is NO real global warming crisis. This low figure of climate sensitivity has been exaggerated by up to approx. ten times or more by climate modelers cited by the IPCC, slowly declining to approx. five times too high over the past decade or so. From the very beginning circa the 1980’s, global warming alarmism was a false, fabricated crisis. It is now the greatest scam, in dollar terms, in human history, wasting tens of trillions of dollars of scarce global resources. … there is NO credible evidence that climate sensitivity is greater than about 1.0C to 1.5C/(2xCO2). Christy and McNider (1994 and 2017) calculated a TCS of 1.1C/(2xCO2) using satellite data from 1979 to mid-2017. They ASSUMED (for the sake of argument) that ALL observed warming was caused by increasing atmospheric CO2, after accounting for the known cooling impact of volcanoes. Therefore, this calculated 1.1C warming is an UPPER BOUND of climate sensitivity, and the probable value is less than 1.1C. Lewis and Curry (2018) calculated an upper bound TCR of 1.2C and an ECS of 1.5C, using surface temperature data for the period from 1869 to 2016. This low climate sensitivity suggests any manmade global warming will not be catastrophic – instead it will be mild and beneficial for humanity and the environment. Furthermore, atmospheric CO2 is not alarmingly high, it is alarmingly low in Earth’s history, and increasing CO2 from whatever source is hugely beneficial. My best guess is that TCS is even lower, probably between 0.0 to 0.5C/(2xCO2). Furthermore, I expect we will see global cooling starting soon due to low solar activity, because much of the observed warming in the late 20th Century was natural, not man-made, and natural global cooling is probably imminent due to the decline in solar activity in Solar Cycle 24 and 25. Global average temperatures will probably trend cooler, not warmer, for the next several/many decades. I hope to be wrong, because humanity and the environment suffer during cooling periods, but my predictive track record to date is infinitely better than the IPCC’s. I bounded TCS at approx. +/-1C/(2xCO2) using the same assumptions as Christy and McNider (2017) – attributing all global temperature change to atm. CO2 and volcano aerosols – the minus 1C/(2xCO2) is derived from the global cooling period from ~1940 to ~1977. In fact, TCS is probably between 0.0C and +0.5C/(2xCO2). That is, IF TCS exists at all in significance – because I proved in 2008 that atmospheric CO2 trends LAG global temperature trends by ~9 months in the modern data record. CO2 also LAGS temperature by ~~800 years in the ice core record, over a longer time cycle. In summary, CO2 LAGS temperature at all measured time scales. Since the global warming parameters TCS and ECS are based on the ASSUMPTION that CO2 primarily drives temperature, it is critical to this hypothesis that the cause precedes the effect, but it does NOT. The global warming hypothesis fails based on Precedence (Richard Feynman called this Causality). In conclusion, the global warming hypothesis contends that the future is causing the past, a contention that is FALSE (within our current space-time continuum). It’s a bit more complicated than that, as I have explained elsewhere on wattsup, but not much. This irrefutable fact disproved the catastrophic human-made global warming hypothesis ten years ago – there is NO credible human-made global warming crisis. This conclusion should have stopped the debate on global warming alarmism a decade ago, and it barely caused a ripple in the warmist juggernaut. Since I published my paper on icecap.us in January 2008, I have given this specific issue a decade of thought, and I’m still quite sure that there is NO CREDIBLE GLOBAL WARMING CRISIS. Using the same assumptions at Christy and McNider 2017 (~all changes are due to increasing atm.CO2), I estimated TCS equals MINUS ~1C/(2xCO2) for the global cooling period from 1940 to 1977, ~equal but opposite sign to the PLUS 1.1C calculated by Christy and McNider for 1979 to 2017.5. What is your predictive track record, Allan? Just curious, not accusative. The reason R&S and I get the same number is that we both use simple radiative equilibrium – how much does a few extra watts of downward greenhouse radiation heat the ground, without fancy feedbacks. My warming model is a one-line equation in the header of the table at lower right, an R&S used essentially the same equation. The main (small) difference between us is the amount of back IR from the sky due to 300 ppm of CO2. I that poster the simple, low sensitivity model fits the observed temperature rather nicely. Subsequent models, run on supercomputers and the product of a billion $$$ climate industry, have done much worse. Amazing, that R&S had the question solved nearly 50 years ago. Dave, what are the two most important issues in this “climate change” debate? 2. Government programs to promote (and subsidize) “green energy”. 2. Green energy schemes such as grid-connected wind and solar power are not green and produce little useful (dispatchable) energy, due primarily to intermittency. If someone still contests these facts after several decades of irrefutable evidence, then they simply do not want to admit the obvious truth. I trust this is a sufficient predictive track record for any objective person. I suggest that the other six statements in our Rebuttal also materialized in those countries that fully adopted global warming and green energy mania. Please also note that NONE of the IPCC’s very-scary predictions about catastrophic global warming, extreme weather, etc have materialized. Since we are not yet in 2020, this prediction still has a few years to run – but with SC24 the weakest in 100 years and SC25 looking similarly weak, this prediction is looking good, with global cooling probably starting closer to 2020 than to 2030. I hope to be wrong about this last prediction, because humanity and the environment suffer in a cooling world. Allan, I would suggest that conclusions (your 1 and 2) are not predictions. Your prediction of cooling in the 2020 to 2030 timeframe is a prediction. I am not arguing with you; CAGW is an unsupported political and rent-seeking scam. Dave – I also correctly predicted the dramatic cooling event that Earth just experienced, but that was only predicted ~4 months into the future, based on Nino34 area SST’s. Thank you Richard Keen for your note and poster. I sent you an email – hope you like it – comments welcomed. “By having a vague theory, it’s possible to get either result.” – Richard Feynman. We agree on the conclusions Dave. Re your concern about the wording, perhaps you are “splitting hairs”. 1. “Climate science does not support the theory of catastrophic human-made global warming – THE ALLEGED WARMING CRISIS WILL NOT EXIST.”. in 1990 I wrote a Strategic Paper that predicted and detailed the steps needed for the successful turnaround of the moribund Canadian oilsands industry. These steps were all implemented, and Canada became the 5th largest oil producer in the world. This prediction was straightforward, because of the four major elements that caused the turnaround, I had already initiated or co-initiated three of them. These three elements were new tax terms, new royalty terms, and a production increase at that reduced unit cost from $18 to $12 per barrel of synthetic crude oil. The fourth major element vital to the turnaround was SAGD technology, done by others. I understand your issue – but isn’t whether a statement is a prediction (by your definition) just a minor matter of sentence wording? a) advised the Alberta Energy Regulator that it must investigate the Mazeppa sour gas project and take action to ensure public safety. b) advised the Alberta Energy Regulator that it must investigate the Mazeppa sour gas project and take action or thousands of people could die. In both cases the meaning is the same, and both statements contain an implied prediction – in this case a conditional one – that if corrective actions are not taken, there is a significant probability that people will die. One of the few objective measures of a scientific statement is its ability to predict future performance – some say this is the very essence of science. Then there is the classic test of a scientific hypothesis – “is it falsifiable or not?” In such cases, we are discussing its ability to predict future performance. I received an award this past week from the Society of Petroleum Engineers. As an uninvolved citizen and a Professional Engineer, I was advised in May 2016 of an extremely dangerous situation. Following the Professional Engineers’ Code of Ethics, I investigated, established the facts and reported to the Alberta Energy Regulator (AER). This situation was then made safe by the AER. This action by the AER is the most severe reprimand against any company in the history of the Alberta energy industry. The potential death toll in a worst-case scenario could have totaled many tens of thousands – a Hiroshima-scale disaster. THIS ACTION BY THE AER (FORMERLY THE ERCB) IS THE MOST SEVERE REPRIMAND AGAINST ANY COMPANY IN THE HISTORY OF THE ALBERTA ENERGY INDUSTRY. THE MAZEPPA PROJECT WAS RUNNING 40% H2S. H2S IS HEAVIER THAN AIR AND INSTANTLY LETHAL AT CONCENTRATIONS OF 0.1% AND LESS. THE POTENTIAL DEATH TOLL COULD HAVE NUMBERED IN THE TENS OF THOUSANDS. One more successful prediction – this one by my friend Joe d’Aleo. One of my friends and co-authors is Joe d’Aleo, an American Weather Forecaster who was the Founding Chief Meteorologist for the Weather Channel. The National Weather Service (NWS) of the USA forecast a warm winter for 2014-15 and Joe told me in October 2014 that the NWS forecast was seriously incorrect, and that the next winter would be particularly cold and snowy, especially in the populous Northeast. This was the second consecutive year that the NWS has made a highly incorrect (excessively warm) Winter forecast, in Joe’s opinion – and he and his colleagues at WeatherBell have an outstanding track record of accurate forecasts. Joe and I had been working together on a paper on Excess Winter Mortality, and I suggested to Joe that this false “warm winter” NWS forecast was dangerous, especially if the country and its people were unprepared. Joe agreed, but did not know how to tackle the problem. I proposed an approach, and we prepared a presentation for my friend at the US Energy Information Administration (EIA). At the EIA’s request, Joe then prepared his own Winter Forecast by month and by region, and the EIA re-ran their Winter Energy Demand calculations. Using Joe’s forecast, the EIA projected 11% more total winter energy required for the entire USA than the “warm” NWS forecast had projected. That is an awful lot of energy – mostly oil, natural gas and coal. After that brutally cold and snowy winter, a back-analysis showed that the actual winter energy used was 10% more than the projection using the NWS weather forecast, and just 1% less than that using Joe’s forecast. I’m not sure if we saved any lives, but I still think we did a good deed. 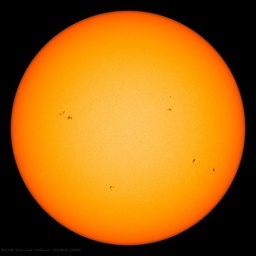 Solar brightening and less clouds is well known. Due to clean air act. Maybe we will talk about moon brightening, just to avoid the obvious temperature connection. Now how about the various clean air acts in the western world in the 60s and 70s that saw us cut particulate emissions. How much warming did that cause? And all the pollution that pours into the air from China and India? No effect? There is far more industrial activity going on in the world now than decades ago and millions more cars and trucks. If you look at China and its increasing particulate emission it starts to really kick off about the time GW ended, 1999. We stopped emitting so much in the west in the late 70s, and the post war cooling trend stopped. Between these dates there was warming. I see a big correlation there. He appears to only consider one aspect of the role of particulates in the atmosphere, namely the passage of sunlight in to the atmosphere to heat the surface. There is also the effect of direct absorption and direct heating of the atmosphere by the particles. There is the absorption of heat (long wave) radiating from the surface and that warming the atmosphere. He also ignores the importance of particulates as condensation nuclei allowing for more or less condensation and water droplet formation and resulting cloud percentage changes. He apparently ignores the fact that different particulates create different water droplets that in turn affect different wavelengths of light. For example, decreased voclanic activity means fewer suldur particles, which produce sulphuric acid droplets that block a higher percentage of yellow sunlight. Finally, I am unaware of any reasonably accurate measures of the total nature and volume of particulates in the atmosphere or how it varies over time. What are the variations in percentage of particle sizes over time.? Particulate size is crucial in how it affects radiation, altering whether it absorbs, reflects or scatters the light. For example, it could be that the recently claimed reduction in global wind speed reduced the number of larger particulates in the atmosphere, it could be the reduction of summer fallowing in fields across North America and adoption of Zero and Minimum till to reduce soil erosion. Without most of the facts and lack of understanding of most of the mechanisms al this is speculative hand waving by people looking at one small part of a very complex system. Much of this focus and distortion is created by the obsessive and arrogant desire to consider or blame human activities for every change measured. Mr. Ball You will clog up all the climate model algorithms with all this info. Tim, Can you explain for us dummies exactly why temperature increase from adding more CO2 is a logarithmic function. The IPCC doesnt believe this. The logarithmic function issue is irrelevant. All the IPCC and therefore most of the world ‘know’ about CO2 is that if it increases temperature increases. In every record I know of, the opposite happens. To my knowledge the only place in the world where a CO2 increase causes a temperature increase is in the computer climate models. … temperature increase from adding more CO2 is a logarithmic function. The IPCC doesnt believe this. Au contraire. The IPCC fully subscribes to the conventional definition of climate sensitivity. It is given in degrees per doubling of CO2. That, mon ami, is logarithmic. Thank you! And, since no one has been able to respond in any meaningful way to my requests to quantify how CO2 is causing any temperature increase on Mars where it makes up 95% of the atmosphere, I invite you to extend your claim and not limit it to this world. No Problem! 🙂 CO2 is a lot denser than air. link That means it has a greater lapse rate. That, in turn, results in a greater surface temperature. I leave the math to you as an exercise. It has been known since 1999 that CO2 lags by 600 years with temperature increase from Vostok ice core. It does not falsify the GHE but it seems the climate is less sensitive to CO2 than claimed in models and even historically derived estimates of TCR. It’s likely the climate has strong negative feedback that man-made CO2 has barely measurable effect in the temperature records. “if it increases temperature increases. In every record I know of, the opposite happens. Can you show a single example Tim…or are you making it up? Is CO2 increasing in Mar’s atmosphere? Why? By how much? If no increase, balance was achieved long ago so no temperature increase now. That is the meaning of ECS. Or rather the meaning of the E in ECS. Was climate scientist Richard Keen‘s paper relegated to a poster session at the conference rather than a podium presentation because it detracted from the CO2 warming narrative?? Possibly because they have heard it all before. Here he is back in 1983. Yep, they heard it all before, 35 years ago – that 1983 paper was brilliant in it’s description of the stratosphere in 2018. Nothing the IPCC has done has panned out so well that long into the future, right Nick? Posters are now easier to do, and much nicer than ever; say 20 or 30 years ago. Unless one wants to be a bit rude, one has to go into a room and sit through several papers just to hear the paper you want. With a poster session you get to see the graphics without eye strain, and you can easily question the author. Also, you get to meet and greet folks that are attracted to your interesting (pretty) graphics. They, and you can partake of drinks and munchies. Posters sessions seem to be by self-selection on the presenter’s part. I’ve chaired sessions so am familiar with the paper review process. A portion of the papers are selected for podium and the others are posters. Actually, I had a choice spot at the poster session, right across from the food (which was excellent) and beer. Last year I spoke; the year before ’twas a poster, and so on. So there’s no pattern of “relegating”. A nice thing about posters is that they get linked to the conference proceedings and are self-explanatory, mostly, while the speakers’ posted PPT slides lack the titillating narrative. Thanks – glad you had a good spot at the poster session – also glad your paper received wide exposure at WUWT. How is this different from the Mauna Loa Apparent Transmission https://www.esrl.noaa.gov/gmd/webdata/grad/mloapt/mlo_transmission.gif ? Exactly what we should be looking at. But surely we knew all this? Painters used to come to London in the 19th century in order to paint the famously atmospheric landscapes caused by pollution. The temperatures taken at Kew near London were often many degree lower than 20 miles away that was outside of the pollution and therefore received more sun. More specifically it warms the sea. I did some experiments a few years ago, that I reported here, to test the warming effects of the sun on the sea, which involved buckets, a rowing boat and very strange looks by people on the shore. Lindzen’s IR iris response hypothesis shouldn’t just be confined to the tropics. “Strange but true: You can learn a lot about Earth’s climate by watching a lunar eclipse.” True, but not strange. As with a solar eclipse, the Earth is ideally situated for observational science. Ref. The Privileged Planet. Data is where we lack. I list a few of the more important ones. This makes it that much harder to get a handle on the climate. Radical Political agenda and buckets of cash from the punters is always preferred over data. You really can’t do anything useful with data but with the former you can change the world. Exactly. Printing an unlimited amount of dollars has changed the world. Abolish the unconstitutional Federal Reserve System. ” a handle on the climate”. If I’m not mistaken Earth is still in an ice age. In other words TOO COLD. If it suddenly came out of the ice age, I’d be drowned. Luckily, that won’t happen. Drowned???? How fast are you thinking it could change because you certainly won’t live long enough for that to happen. If half of 0.3C over 40 years was caused by the atmosphere clearing, and half of what’s left was caused by the warm cycle of the PDO/AMO. Even if we assume that CO2 was the cause of everything there’s not enough warming to worry about. 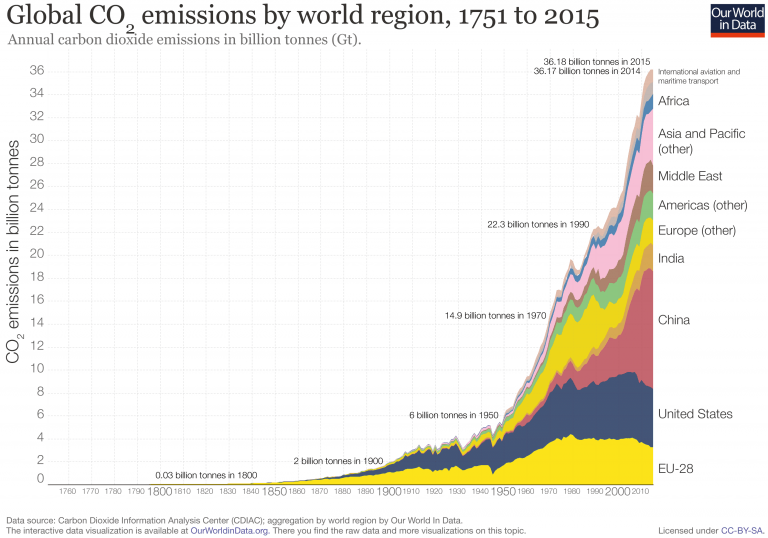 China and India are still producing a lot of pollution, but Earth’s skies probably are globally clearer now than for most of the 20th century. Not too difficult to confirm. China still has serious pollution, so look at the temp trends in the polluted areas compared to nearby, upwind pristine areas. This would be a climate sensitivity factor of between about .17 and .34 C per W/m^2, which is well below the IPCC’s range of between 0.4C and 1.2C. How would something like this get past pal review? If you believe the IPCC sensitivity, we should be seeing a warming of between 0.25C and .75C from the 0.6 W/m^2 of increased forcing, not just 1 or 2 tenths of a degree. Where’s the rest of this warming hiding? It is a poster presentation at a conference so essentially un-reviewed. Let’s see if the author(s) can get this published anywhere. I do not recall the atmosphere being that dirty back on 1992. I believe the picture was taken shortly after Mt Pinatubo erupted. I don’t remember it being colder! In the same way you don’t notice a 0,7ºc of warming. So, only volcanoes and CO2 affect global temperatures? What about the gradual warming from the Little Ice Age? Increasing AMO? And so on. How is such a miniscule AGW warming distinguished from natural variation? More magic algorithms? The dozens of GCM that run GHG-AGW theory all predict the troposphere should warm more rapidly, especially at tropical latitudes under increasing pCO2. That is the air about 5-7 miles up should warm faster than the surface, in terms of anomaly values if GHG-AGW theory is robust. Volcanic aerosols though, to be long lasting, have to be in the stratosphere. Aerosols (sulfates mostly) in the troposphere are washed-out within weeks to a month. Thus the long-term effect of aerosols is to warm the stratosphere slightly and cool the troposphere through their scattering short-wave sunlight back to space. So now we have this phenomenon where the tropical hot spot in the mid-troposphere is not detected as predicted by theory. Meanwhile the surface has warmed by every dataset. This doesn’t mean GHG-AGW theory is disproved completely, as the water vapor feed-back amplification effect most GCMs employ, which is simply hand-tuned in to provide the desired final GHG sensitivity, is likely to be negative feedback instead of a 2x positive feedback. it just means that the bulk of surface warming isn’t due to a GHE. This can only lead to the conclusion that the warming in the surface is due to something(s) else. Less aerosols, while having several decades of an active sun, quickly moves to the top of the list. BTW: the only total lunar eclipse in 1992 was December 9-10, 1992. 5 months after Pinatubo popped its cork. correction: Pinatubo’s major eruptive event was June 15, 1991. So the Dec 1992 total lunar eclipse was 17 months later. fossil fuel use–may cool Mother Earth, infuriating the AGW Hysterics. Everything that was once made in the West is still being made. More coal is burned now than was burned 50 years ago. And much of it without even precipitators. Yes. Not only more, much more. And what can the U.S. and Europe do to decrease the growth in CO2 emissions? Exactly Dave. The West benefitted from decades of fossil fuel combustion but now the East cant. Horns meet dilemma. We set a new record for CO2 emissions in 2017 and 1st quarter of 2018 were up 4% on 2017 … but we will always have Paris. I wonder how much pain the Europeans inflict on themselves before they work out this is going nowhere. For Germany it’s a double funny as they continue with the planned Nord Stream 2 gas pipeline to make themselves reliant on Russia. Seems WordPress is back to sending my posts to the bit bucket instead of moderation.. SIgh. That keeps happening to my comments, as well. I had one ‘vaporize’ a week back, when I hit the ‘post comment’ button. It showed up the next day, in the proper comment queue and at the correct time when sent. ??? !!! It is called shadow banning. Twitter does it, too. I suspect it has nothing to do with AW’s site settings. This goes on under-the-hood at WordPress IT ops. Because AW and his crew of regulars are adding 3-4 articles/day on average, delaying a comment from targeted individual by sending it to Spam bit-bucket simply buries it and severely decreases the number of people who will eventually see it, and giving less chance to further comment on it. Twitter is notorious for this covert attack on conservatives users. They delay tweets from getting to just a few high impact followers, those with very large followers themselves for several hours. Most of the original tweeter’s followers get the tweet so it looks as if nothing is amiss. But delaying it to high impact followers greatly diminishes the likelihood it will be re-tweeted by the high impact followers, thus keeping it from trending on Twitter, where it would get even more exposure. Shadow banning – It is how the Left operates to suppress their perceived political adversaries. It’s not shadow-banning here. WP will put a comment in the Trash folder due to an IP Address blacklist issue…as best we can tell. The mods regularly dumpster dive to retrieve good comments. Once they’re restored, they appear in the correct location as though they weren’t originally trashed. As for Spam (which is a separate folder), it’s sometimes a bit harder to tell. The Spam filter will catch the obvious bot posts, but sometimes a legit comment gets thrown in there as well. This requires dumpster diving too. Traffic at WUWT is decently high, so sometimes it will take a while before a mod has time to get to it. the problem is my IP address should not be on any blacklist. And my comment @11:25am doesn’t appear to have any words that would put in Spam. You think the “Left” are in charge of Twitter? Careful of what you write, the sneaky buggers are probably watching your every move. Can ice core data give information about the jolly good state of the atmosphere, esp. the amount of aerosols, be them volcanic or otherwise, back in the day? I just assume that they do, but I am not sure about. Are there results from ancient cores and are they interconnected with temperature anomalies? It seems that an extra 25 hours recorded sunshine per year might correspond to additional 1 w/m2 of radiation over the year, suggesting that England is now getting an extra 6 watts/m2 of incoming radiation hitting the ground. The extra 6 watts/m2 is the average over 24 hours i.e over both the day and night time. At least the benefits of clean air is still something that everyone can agree with. Oops! This reminds me – must clean the windows. There is an eclipse here on Earth every day, as day turns into night and 12 hours later the dark emerges into the light. Anthony being a weather man should have heard this saying before ” red sky at night, sailors delight. Red sky at dawn, sailor be warned. But what does it mean Anthony ?? Mmmm … the CERES data shows a change in downwelling solar at the surface with no clouds of 0.007 W/m2 per year, or less than a W/m2 per century. Eclipses seem like a really, really dumb way to measure the optical depth of the atmosphere … what am I missing here? the data products you use have been so deeply “re-calibrated” and “recomputed” as to essentially remove signal? so I sez … we’ve met & talked before, and I know you’re not speech impaired, so I’m at a loss to explain your “dumb” and non-specific comment. w. sez again… what am I missing here? so I sez… A lot, including the fundamental optics of eclipses. Read Kepler’s 400-year old treatise, extracted on the poster. The brightness of a lunar eclipse is diminished by the passage of VISIBLE wavelength through the layer of VOLCANIC AEROSOLS in the STRATOSPHERE, GLOBALLY averaged, amplified by 40 times due to the grazing path through the layer at the limb on the Earth. So it directly measures the EXACT parameter of interest to climate studies. I would think that it would pretty much balance out: the lack of particulates lets more sunlight in, it also lets more IR escape at night. Considering that the rise in the average temperature of many places over the last century has been accomplished by less cooling at night instead of more warming during the day, I’d say the net effect of all the factors is not a balance between warming by day and cooling by night. And, since it is impossible to build a test chamber that will allow for convection to altitudes of 50,000 feet, there is no way to test which particles or gasses in the atmosphere are having which effect. All we can do is check measurement records for anti-correlations. I say anti-correlations because correlation cannot show causation, while anti-correlation may show non causation. As an analogy, even when there is insufficient evidence to determine the perp in a criminal investigation, it is still possible to clear any having an alibi. The problem you don’t seem to consider is the lapse rate change at the tropopause and the cold of the stratosphere where they sulfate aerosols are located. Think about that. The atmosphere is not a homogenous layer of gas and well mixed particles. The moisture is preferentially confined by precipitation and cloud formation to the lower half of the troposphere. Non-condensing GHG’s are assumed to be uniformly mixed, which they probably are to the degree that matters for climate. Ozone is concentrated in the stratosphere, which is also where longer-lived volcanic aerosols were. I have serious doubts that you can measure global average temperature (whatever that means) to 0.3 degrees C over 40 years. Take that one up with Roy Spencer. The MSU observations are global (unlike surface station temperatures), and can measure 0.3C of warming. If aerosols really had the forcing that climate models assume you could fix global warming in an instant. Just turn off all the flue gas desulfurization units on coal fired power stations and use high sulfur oil in sea vessels. We’d actually save money doing so too. Greens don’t like logical inferences like this. The only reason aerosols are so powerful in the ensemble models is they are needed to “correct” the overegged CO2 forcing so the model output vaguely fits the 20thC verification period. Look up the North American weather data for September 12th and 13th, 2001, when planes weren’t spewing carbon soot into the sky. Hmm…half the warming since 1995 because of a reduction in aerosols admitting more sunshine, and it would appear that natural variation that resulted in the Dreaded Pause contributed half of the remainder at least (that was predicted by some researchers BTW, anyone with a link?). Both these contributions are based on empirical measurement, a rare commodity in climate science. If he’s saying the the eclipsed moon was blue in 1992 and red/orange after 1995 then he’s crazy. The eclipsed moon is always red/orange. If anything an eclipsed moon after a large volcanic eruption would be more red/orange. Volcanic ash in the atmosphere filters more blue light than red light. I’d like to see the carefully calibrated data from decades of lunar eclipses used. I bet it doesn’t exist. Actually, volcanoes darken the eclipse to make them dark red, brownish, or colorless. Volcanic ash – particles of rock – filter all wavelengths of light equally, as do the more relevant sulfuric acid droplets (the real substance of stratospheric haze). That because ash particles and acid droplets are much larger than the wavelength of light. Not sure what “carefully calibrated data” you dream of seeing, but the poster does show 200+ years of eclipses. BTW, the blue is real, due to light passing through ozone in the upper stratosphere on its way to the moon. Ozone absorbs red light, and transmits blue. When volcanoes block the lower stratosphere, this upper stratosphere light gets through. I wasn’t objecting to anything particularly quotable, I was objecting to the underlying procedure itself. I’m talking about the whole idea of measuring the changes in atmospheric optical depth using eclipses. Here we go. For starters, you say that total eclipses occur “about once per year”. In fact, they only occur about once every 18 months. That means in thirty years we only have twenty of them … and twenty is a very small number for N.
Second, often it’s cloudy during an eclipse. So we’re down to less than twenty for N in 30 years. Third, there are a variety of other things that affect the atmospheric optical depth through which you are taking the photograph. Smoke, haze, temporary aerosols, ice crystals, very thin clouds, small salt crystals, and water vapor all affect the AOD. How can you remove these from a one-off observation? Yes, you can compare the moon to nearby stars, but the colors of the stars and the moon are quite different, so the losses will be different—atmospheric absorption of light is frequency-dependent. Fourth, each time the observation is done from a different spot on the planet … which will likely be at a different altitude, with different permanent, semi-permanent, and temporary conditions affecting the conditions of the photograph. Fifth, if the photo is not taken at the exact instant of totality, the calculations for the theoretical brightness will e off by some unknown amount. Mmmm … first, you are not averaging just the volcanic aerosols in the stratosphere. The light hitting the moon doesn’t just go through the stratosphere. It passes through the troposphere as well. You are using an “assumed cloud distribution of 50% in the troposphere”, but obviously nature is never that regular. The light is passing through a thin band at the terminator, and there is no reason to assume that clouds in that thin band, which is located at a different part of the earth for each eclipse, is either consistent or 50% … and many reasons to believe it is not consistent or 50%. Next, the temporal resolution of the eclipse data is quite bad. You have carefully picked six volcanoes in your poster. As you describe it, “Likely VEI = 4 or 5 Noted”. But that is only a small fraction of the VEI 4 – 5 eruptions during the time period. I digitized your AOD data for the post-1995 part of your poster, and added the VEI 4-5 eruptions during that time period. I’m sorry, but I’m just not seeing the correlation between the AOD (orange circles) and the VEI and timing of the eruptions (gray dots). I also don’t understand why the orange line has bends in it when there were no eclipses during that time. So … those are my objections to the procedure. My apologies for my lack of details before. I was moving fast, looked at it, saw the whole host of problems I listed above, and went “whaaa?